If you’ve watched college football for any extended period of time, you’ve probably heard the old adage that SEC football is a “line of scrimmage league.” And history has proven that to be true. I did some research to see just how true that old phrase is, and it looks like whoever came up with that saying knew what they were talking about. Ever since the SEC expanded to 14 teams in 2012, every division winner of the East and West has finished in the top half of the SEC in at least two of the following categories: sacks allowed, team sacks, team rushing yards per game, and rushing yards allowed per game. All of those categories are directly affected by a team’s play in the trenches, and usually the best teams in the SEC have some of the best players on the offensive and defensive lines. According to my research, there’s a huge difference between the teams who finish in the top half of the conference in those four categories and those who finish in the bottom half. From 2012-17, teams who finished in the top half of the SEC in total team sacks have an overall win percentage of .711 during that six-year stretch. Teams who finished in the bottom half of the conference have a overall win percentage of .493. Similarly, teams who finished in the top half of the conference in rushing yards over the last six years have had a winning percentage of .710. The teams who finished the season in the bottom half of the SEC in rushing yards have had just a .499 winning percentage the last six years combined. How has Tennessee fared in these categories over the last six years? Not very well, as you might imagine. Only one year saw the Vols finish in the top half of the SEC in three of the four categories. In 2015, Tennessee had the second-most rushing yards in the conference, finished fifth in total sacks, and sixth in sacks allowed. They finished ninth in rushing yards allowed. Tennessee had two top-half finishes in 2016, placing fifth in team sacks again and seventh in rushing yards while finishing eighth in sacks allowed and 11th in rushing yards allowed. Last season, Tennessee was 11th or worse in all four categories. In fact, the Vols have finished last and second-to-last in at least two of the categories every year besides 2015 and 2016 during the 2012-17 span. The Vols were last in rush yards allowed and 13th in rushing yards and team sacks last season, they were last in sacks allowed and 13th in rushing yards in 2014, and they were last in sacks and 13th in rushing yards allowed in 2013 and 2012 both. Victory starts in the trenches. And Jeremy Pruitt is doing his best to rebuild the Vols’ interior on both sides of the ball. In Tennessee’s 2018 signing class, Pruitt and his staff brought in nine players who project to play on the offensive and defensive lines. And three of those players, JUCO defensive tackle Emmit Gooden, JUCO offensive tackle Jahmir Johnson, and four-star Jerome Carvin, should be able to contribute immediately at their respective positions. And that doesn’t include the addition of Alabama grad transfer offensive lineman Brandon Kennedy too. The Vols’ 2019 class currently has 12 commitments, and four of those commitments are projected offensive and defensive linemen. And the average height and weight of those four prospects is 6-foot-5, 297 pounds. Tennessee has struggled mightily in a multitude of areas over the last six-plus years. But the strength of a football team, especially in the SEC, is measured by how good their offensive and defensive lines are. And Tennessee has consistently had some of the worst offensive and defensive line units in the conference over the last few years. 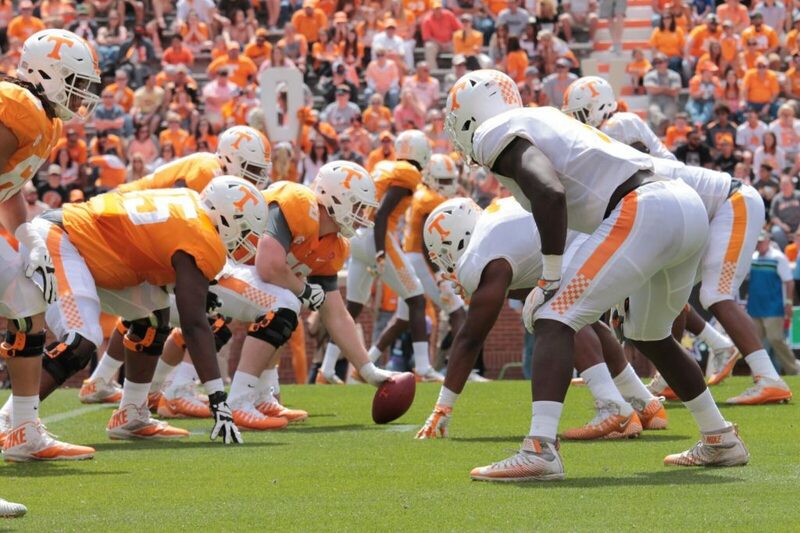 Whenever the Vols have had a good offensive line, they’ve ended up having a bad defensive line to counter that. And when they’ve had good defensive line play, their offensive line has struggled to play consistently. Butch Jones tried to rebuild the Vols in the trenches too, but he and his staff ultimately failed in that regard. They went for flash and potential over substance and grit. Time will tell if Pruitt falls victim to the same problem or if his recruiting methods are superior. But his plan to rebuild Tennessee thus far is on the right side of history, and Vol fans hope the results of his rebuild are far better than the last few coaches who have led the Vols.